Martin Freeman blessed the first film in the Nativity! franchise with a special mixture of grace and compassion. And, in doing so, may have spawned a monster. Since the 2009 feature, Debbie Issit has expanded her festive saga to include two instalments. Whilst each subsequent film has resurrected the concepts of singing children, slapstick humour and, nauseatingly, the character of Mr Poppy, neither of the latter movies comes close to capturing the surprising charm of the original. This is no small part due to the absence of Freeman who managed to inject his role with an astonishing amount of pathos and laid the groundwork for the series to continue without him. Stepping into the majestic Freeman's shoes as a first replacement is David Tennant as Mr Peterson - a new teacher whose introduction to Saint Bernadette's comes in the form of (the aforementioned) Mr Poppy (Marc Wootton, reprising the least likable role in all of fiction). Of course, their meeting is not a pleasant one - Poppy, a teaching assistant, mercilessly mocks and bullies the meek new arrival in front of a class of school children. Peterson's Scottish brogue is aggressively mimicked and tempers flair for reasons we can only conclude belong to psychopathy on Poppy's behalf - Peterson is the latest in a long line of teachers the idiot-menace has tried to drive away with his unconventional and mean ways. It is not hard to conclude that the kids' access to an education, and having a decent teacher, is the last thing Poppy desires. Once again, the character inspires ire rather than empathy, sympathy, joy or any of the warm feelings one would associate with Christmas. In keeping with the lack of yuletide feeling, Nativity 2: Danger in the Manger sees Peterson, Poppy, et al set out on a day-trip to the green, green valleys of Wales. The crew are there to enter a National "Song For Christmas" Competition - a narrative device which is also used to justify the movie's existence as seasonal feature too. At no point in the road-trip to the competition - which includes an elongated detour into the wilds with a stray donkey - are we introduced to anything one may traditionally associate with Christmas. Danger in the Manger could have quite easily transpired in a wet May or any other time of the year. Whilst Tennant tries his best with a limited script, the movie lacks warmth or heart - the magic of Christmas and Martin Freeman are sorely missed. Indeed, with Mr Poppy's expanded role, this feels like the mean-spirited adventures of a bully. Loosely plotted and structured, to the point of laziness, and lacking a soundtrack to match the first feature too, this nondescript sequel could have easily marked a (premature) end of the franchise. 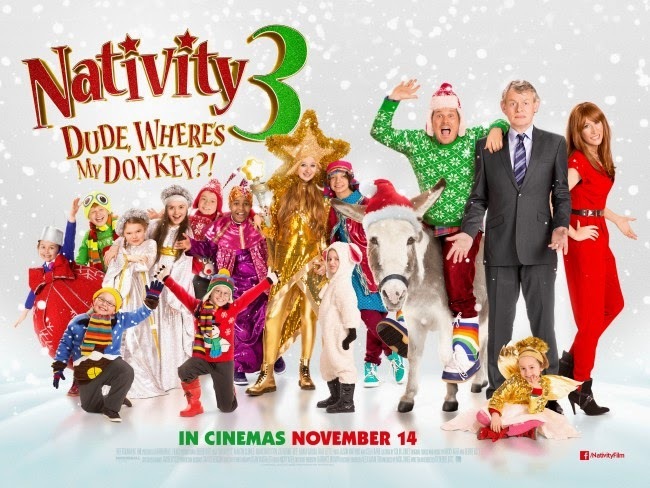 Unexpectedly, the series regains a degree of steam with a third feature - Nativity 3: Dude Where's My Donkey? 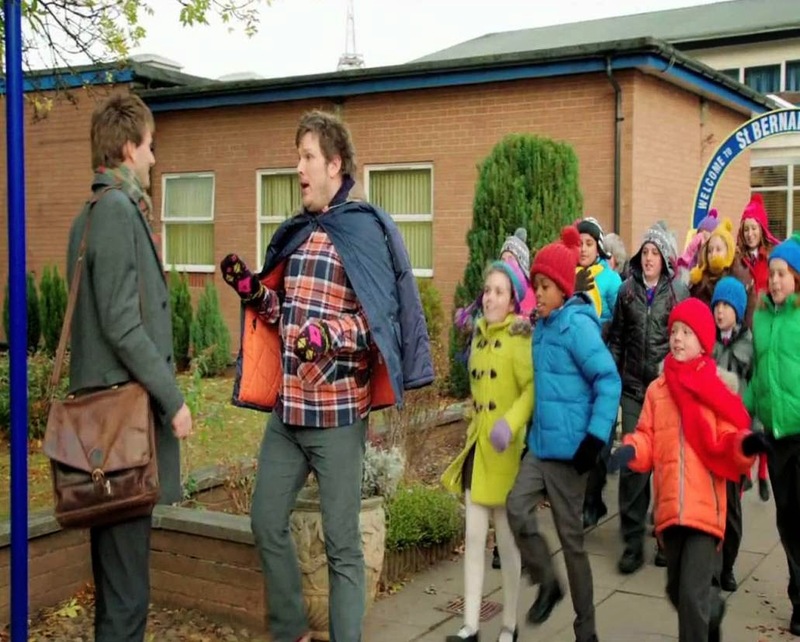 At this point in the franchise, one which features a revolving door of teachers, Mr Poppy (the insufferable Marc Wootton again) has become its de facto star. As such, for the first half hour of the movie, we are "treated" over and over to the boorish antics of an increasingly creepy man-child. Switching gears between loud and louder, Poppy terrorises all adults who dare enter into his world. He is rude, aggressive and intimidating to the women and men he encounters; the worst type of bully imaginable. His attempts at jokes usually involve speaking the word "fart" out loud or shouting voluminously - a tactic which, undoubtedly, will cause mirth in very young children. His anarchic manner of running a class-room comes under threat when OFSTED announces the imminent arrival of an inspector at Saint Bernadette's. In a panic, the school organises for a "Super teacher" to be parachuted in to bring a semblance of order to Poppy's (undoubtedly) under-performing class. That the children had been allowed to fester in an environment in which a resident donkey regularly excretes in a room full of chaos and CONSTANT LOUD NOISES (but little in the way of learning) is truly alarming. Martin Freeman's humane treatment of the children, and inspiring pep-talks, seems a soul-shuddering eternity away. Poppy, again a self-centred psychopath, decides that his emotionally neglected children would be better off training to becoming flash-mob dancers (so as to enter a competition in New York during term-time) than they would be served by a traditional education. So, when super teacher Mr Shepherd (Martin Clunes) is kicked in the head by a donkey and loses all memory, Poppy decides the best course of action is to stay clear of the NHS and allow a man suffering a brutal head trauma to struggle on through life with no real professional help. After all, Shepherd's confused and frightened state is advantageous for Poppy and his ridiculous goals - its easy to persuade a man suffering amnesia to do what one wishes. As luck would have it, however, Shepherd was due in New York over the festive period also to marry the woman of his dreams (Catherine Tate). In convoluted fashion, her ex beau ends up being one of the world's premiere flash mob organisers (?!) - he wants to win her back and, with Shepherd in a befuddled state (so confused he does not even know who his daughter is), may have spotted an opening. Its a farcical and nonsensical tale. The latest episode is saccharine and cloying which is certainly an improvement over Nativity 2 which forgot to include any emotion other than frustration. A welcome return to festive themes is also seen here as we get to witness the magic of New York at Christmas time - the script too remembers to add appropriate seasonal yearning and pathos, whilst Clunes and Tate elevate the story with winning performances. As the pair share a kiss, in the hope his memory will return, the actor heart-breakingly exhales: "I didn't feel anything." The feelings of love he was hoping would come rushing back fail to expire and their reactions to this cruel scenario are as real and human as anything in the series since Mr Maddens left. Sadly this exclamation could also constitute a perfect four word review of its preceding film - and, for the third movie, whilst Clunes and Tate do their best to touch us, the over-riding feeling we leave the franchise with is a visceral hatred for the over-bearing man-child who takes up far too much of the screen time. Did I mention I don't like Mr Poppy?